Get rid of bed bugs with the ZappBug Oven 2! This bed bug heater safely heats its contents over 120 degrees Fahrenheit, which can kill bed bugs of all life stages. The ZappBug is safe for clothing, books, shoes and much more. This version has been updated with dual heaters to ensure total heat coverage, for a more thorough and efficient treatment. Returns on the Zapp Bug Oven 2 are not accepted even if unused due to possible bed bug exposure. The ZappBug Oven 2 is the replacement for the ZappBug Oven. 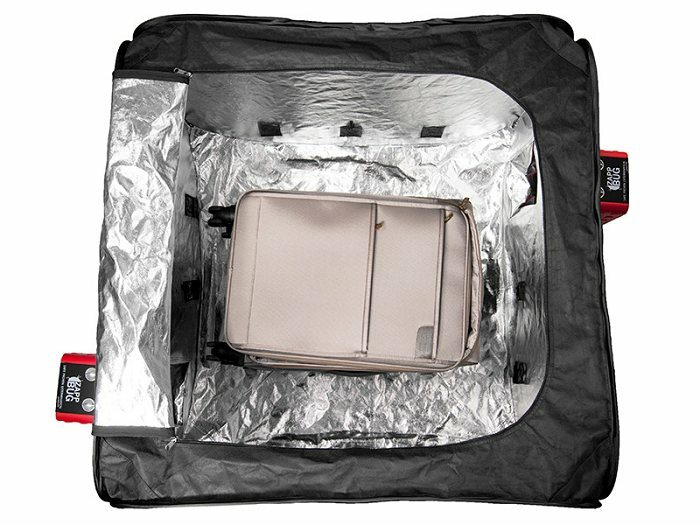 The new and improved Oven 2 now features dual heating units, one on each side of the tent. Now with two heaters, this unique design more evenly heats the items inside while eliminating the risk of any cold spots. Unboxing the unassuming brown box that the ZappBug comes reveals the necessities to a successful bed bug heat treatment: the two heater units, temperature gauge and wireless probes, auto shut-off timers, foam support blocks and support net, an extension cord, and an instruction manual. Setting up the Oven 2 for treatment is easy, and should only take a couple of minutes. 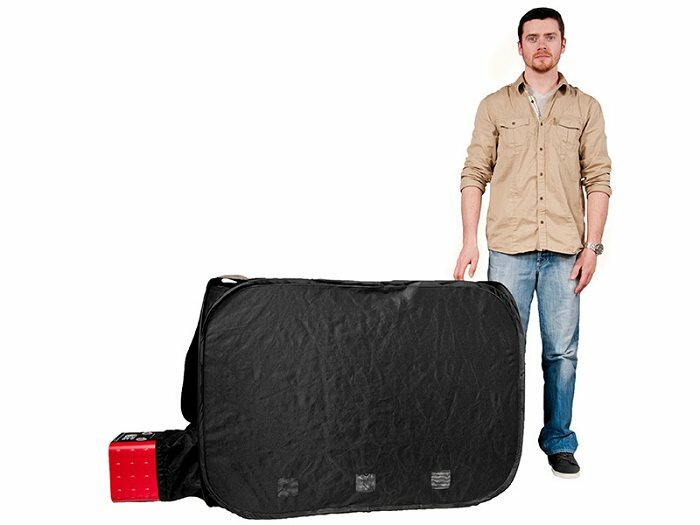 The tent unfolds in seconds in your hands, and doesn't need a separate frame. 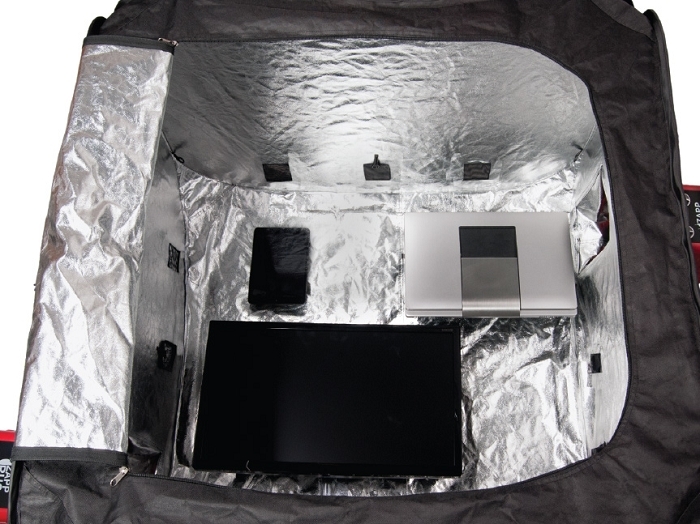 Once unfolded, the tent reveals its two elastic ventilation tubes, which is where the heater units are to be installed. Once assembled, the Oven 2 is ready to be filled with whatever you suspect may have bed bugs. The generous space of the Oven 2 is suitable for a full-sized suitcase (or two), a closet full of clothes, or even some furniture like chairs or night stands. Just make sure that you don't pack anything in too close to the walls, as airflow is needed to ensure everything heats up thoroughly. Once everything we want to treat is packed in, it's time to zip the Oven shut and plug the heaters in. The included timers shut off automatically when the timed treatment is done; simply plug the heaters into their timers, and the timers into the wall. Since it's difficult to say exactly how long it will take to heat everything inside the Oven to at least 120° F, we advise setting the timers to their maximum setting to be on the safe side. There's really nothing to compare to the Oven 2. It's larger than every other heater on the market except for the enormous ZappBug Room (which is really in its own class), yet its low price per cubic foot also makes it a great deal. This makes the Oven 2 a sure bet for any homeowners or pest control professionals looking to treat large items (or a bunch of little items) safely and easily. There's a reason that the ZappBug Oven 2 is such a hot seller; it's a no-brainer. 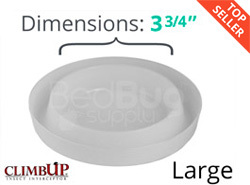 ZappBug kills 100% of all bed bugs and their eggs. Scientific evidence shows that bed bugs die in one minute at temperatures above 120 degrees Fahrenheit. 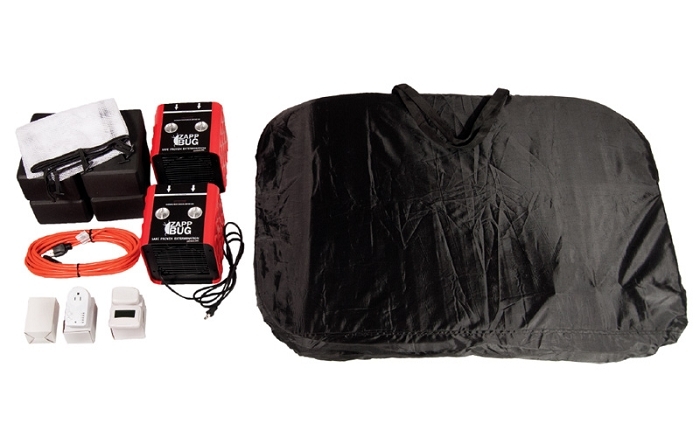 The temperature inside the Zappbug bed bug heater ranges from 120 to 145 degrees. The ZappBug can be set up in minutes, and starts heating with the push of a button. 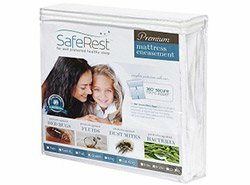 Within six hours, everything inside should be heated to a lethal but safe level, ensuring that all bed bugs and their eggs are killed. The ZappBug can be used to treat clothes, shoes, books, luggage, chairs, rugs, papers, bedding and more. 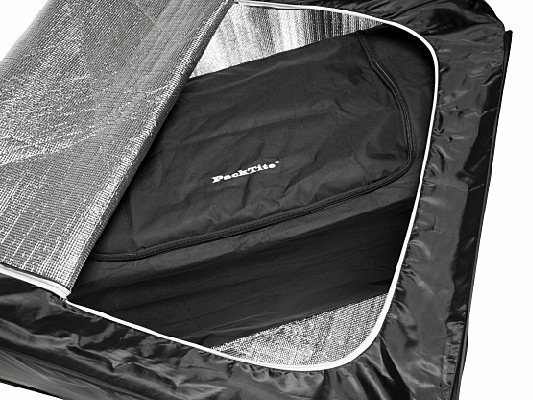 The ZappBug has usable dimensions of 37 in x 37 in x 24 in - four times as much space as the original Packtite, and almost twice that of the Packtite Closet. ZappBug is extremely easy to use. Simply set it up, load it with items and press the "on" switch on the included Belkin timer (making sure that six hours is selected on the timer). The included timer automatically shuts off the heater when the treatment cycle is done. 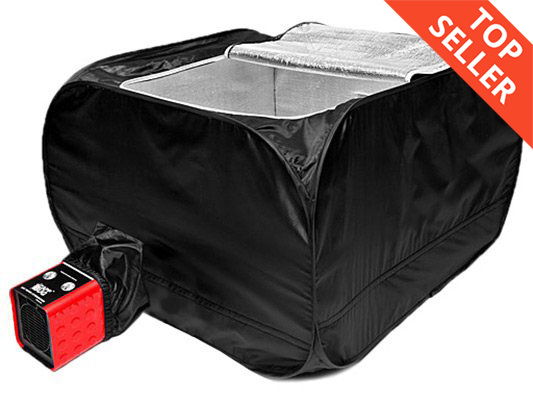 Q: When not in use how much space does the ZappBug Oven 2 Bed Bug heater take up? Also, when in use, can it be set on its side to take up less space? 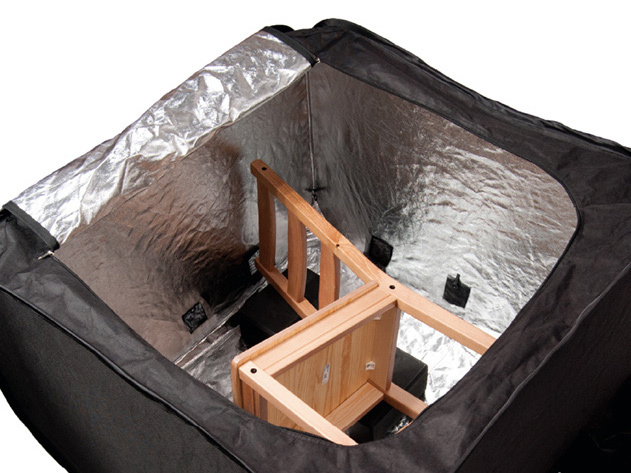 The main tent portion of the Oven 2 folds flat into a very thin and compact storage state. It must lay flat on the ground while in use; if set on its side, the heater units would fall out and be damaged. Q: How is the inside cleaned and how sturdy is the inside fabric? The inside fabric is double-walled and insulated, making it fairly sturdy, like a thick camping tent. However, care must still be taken to avoid rips and tears that would affect the heating functionality. We are not sure what would be the safest way to clean the inside of the heater; after several months of use, we haven't seen the need to clean our ZappBug Room. That would be a question for the manufacturer, who you can reach at (206) 430-5514. Q: Can you provide a list of items that are not suitable for the bed bug oven? It would be tough to come up with a perfect list like that. Would you be comfortable leaving the item in your car with the windows up on a hot summer day? If not, it probably shouldn't go in a ZappBug. Q: Is there a rack to allow air circulation around the bottom or is that not required? The heater does not come with a rack for circulation. You can use your own if you'd like, but it is not required. Q: Do you rent these hearers? No, we do not rent out any of our products. Q: What can I expect the electric bill to be after using this? Each treatment will take up to eight hours, which at about 1.2 kW per hour should cost under $2.50. Since you're only using it once or twice, I wouldn't expect any noticeable change in your electric bill. Electronics might be safe for treatment in a ZappBug, but you'll need to check their manuals to make sure that they can safely operate at 120 degrees F or higher. Q: It looks like this heater has mesh openings at the bottom. Wouldn't this be a concern for bugs getting out? Ventilation is required to ensure safe operation. The mesh is too fine for bed bugs to pass through, and they won't be active in an environment with such high heat circulating anyway. Q: Can you set up in a garage? Does the room need to be at a certain temperature. I travel in the winter and would like to set this up in my garage which can get to low 20’s in the winter. You should only use indoors with an ambient room temperature above 70 degrees F.
Q: I'm looking for a heater to kill bed bugs in cars commercially. What is the BTU rating? Would this device be safe if set up on a fabric base? (Worst case I can add a plate underneath) Would you recommend this device, or multiple, for 50 square feet plus or minus? This is an enclosed heating solution and not suitable for heating a car. You could take my car, before you could get this oven away from me. Piece of mind. Takes the comforters, blankets, books, small furniture. Also feels safe to use. After having it a couple of weeks, I actually let it run all night while I was asleep. Nothing as bad as BED BUGs. Also, as i allowed a silky comforter to slide down and block the duct and burned out one heater..... they gave me great survice on replacement item. Reviewed by: nyla martens from Kansas. The product is quite effective and works as described. However, the heaters have a tipping switch which is very under-engineered. On one unit it just fell out, on the other it wasn't long enough so it went off when it shouldn't. I ended up tapping the switches closed with duct tape. So the safety value of the switches isn't there. Reviewed by: Josiah Strandberg from Providence, RI . We received this product but have not used it yet so I really cannot give you any feedback at this time. Reviewed by: Sally Johnson from Romney, WV. Am usin g i mow and it seems to work fine. Reviewed by: Jeff Hoag from Rochester, MN. This oven is worth its weight in gold. This is a great product for placing your fully loaded suitcase directly inside, set the timer; then watch the remote thermostat as the temperature rises to 120F. This product also works great on containers packed with books or anything else you want to treat. Even your electronics are quickly treated and sterilized. Be aware that just like a Thanksgiving turkey, the more densly packed the items are, the longer it will take to bring the inside core up to 120F. 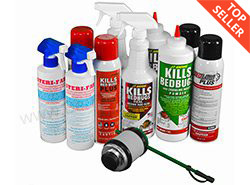 Whether or not you have been hit in the past with bed bugs, this product will safeguard your home from any travel related infestation of bed bugs. The peace of mind is well worth the investment. Reviewed by: Jan from Albuquerque. Somehow I got bedbugs, yikes. Just the thought made me itch. I immediately started doing research on bedbugs. The better you know your enemy the better you can succeed in destroying them. I did all the necessary step including hiring a exterminator. But just my luck my dream apartment was available and I needed to move. So like anyone else I feared I was going to have them once again by moving so soon. I doubled bagged everything. The first bag was a glad garbage bag, followed by a construction bag from home Depot. I wasn't playing. I carefully moved in my belongings making sure no tears in the bag due traveling. I ordered the zappbug and boy that thing gets hot. I kept everything in a isolated room until it was treated. This product is a excellent purchase. When I pulled my belongings out after treatment it was hot to the touch, and nothing got. I even put my 50 inch tv inside. Reviewed by: Fania from New York . Let me start off by saying the effectiveness of the Zappbug oven is 5 stars. I believe it really is killing the bed bugs. I'm at that stage where I found and killed the majority of them in my apartment, but I'm having to find the teeny tiny stragglers that are in my clothing and stuff. BUT I still am only giving it four stars because bedbugsupply.com and ZappBug do not give you fair warning for several things *before* purchase. And yes, I'm upset about that. Let me help you to have a 5-star experience: 1) It comes with 2 heaters, and though it comes with one long extension cord, you should have your heaters on two different circuits (so brush up on which of your outlets are on which circuits). And they shouldn't be old outlets with a weak connection. 2) The oven comes with a remote temperature sensor, which is great. Depending on how tightly you pack the oven, it will reach lethal temperature at a varying times. This is important because if you allow it, the oven can reach over 150F degrees. That happened to me after only 3 hours and I buried my temperature sensor deep in the clothing. So beware of setting the oven for 8 hours and not checking on it. 3) The second reason this is important, and a big reason why I'm disappointed, is that they don't tell you that you should probably do certain items separately and monitor the temperature more carefully. Specifically, I should have done all of my shoes separately, not packed it tightly, and stopped the oven after it hit 130 - 135F because some of my shoes are now warped and ruined. No thank you very much. Most wood and clothing and *certain plastic and rubber can make it to 140+F without damage, but not others. I have not tried electronics because I don't trust it to not damage them. 4) The opening of the oven door on the top is 27"x26", so plan accordingly. Just because the chamber is bigger doesn't mean you'll be able to fit something inside that's an inch smaller than its max dimensions; it has to fit through the door. 5) The heaters aren't noisy, but they make your entire space hot! This is important if you have a small apartment like me. If you didn't notice in the video, there are little vents on the bottom sides. This means that some of the air is escaping. It is designed this way, but you should know this ahead of time if you have a small space. So, in terms of bed bugs, it really is effective. In terms of product warning and complete information before you purchase...not so good. But hopefully I have helped you to make a more informed decision and to use the product to avoid disappointment. Reviewed by: Mark from Minneapolis. Easy set up , fits more items than expected, feel confident about it getting rid of bugs. Reviewed by: beth from milton. The Zapp bug Oven has been a great investment for our agency. It is easy to use and the price was affordable. Reviewed by: Catherine from Wayne. Great product. Easy to set-up and takedown. We've used it a few times already and like the performance of the product. Reviewed by: Scott Seethoff from Amarilo TX.